Who am I as a person? Do I have personal qualities that would make me a better teacher someday? With the use of the checklist find out your personal characteristics which would help you make become a good teacher. The qualities listed are few of the many attributes needed but the list given you would suffice. Look into yourself very well and answer each item very honestly. All your answers are correct, so you do need to worry. 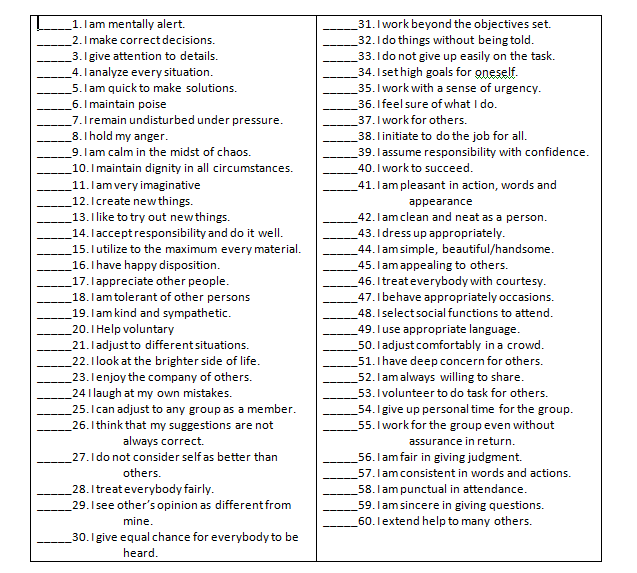 Below are indicators of personal qualities which may describe you. Place a ___ mark on the blank before each item if the indicator gits you most of the time or an ___ mark if the description does not fit you most of the time. Your concrete experience, enabled you to describe, what you are as a person. The qualities reflect who you are. Make a similar observation of ten active teachers in a school. Your observation will be done through a survey and will produce empirical evidences. This observation method will enhance your skills to collect data, like when you doing research. You will be provided with a Survey Checklist for you to produce 10 copies for your 10 respondent teachers. (They are on the last pages of this workbook). Make a proper request from these teachers who will become your respondents. To get the average, add the scores of the ten teachers and divide by 10. Look at the legend in your own checklist, and determine the description of the average. Which of the twelve attributes is the highest among the teachers? Among the 12 attributes, buoyancy is the one that excel from among the high description with point one as a difference. Which of the twelve attributes is the lowest among the teachers? The self-confidence is having the lowest among the 12 with 3.5 as an average. How many teachers are low in emotional stability? Teacher Number 3 was the only one who has the lowest grade in terms of emotional stability. How many teachers are high in compassion? Most of the teachers already reach the very high in compassion; meanwhile two of them didn’t reach that peek. What six attributes are found to be strong among the teachers? What six attributes are found to be weal among the teachers? As the opposite answer in number seven, these six attributes with a weak average are the self-confidence, self-motivation, intelligence, pleasantness, and comparativeness as well reliability can also be consider as one of them. What interesting observations can you spot from the other data not asked? The cooperativeness in answering the questionnaire makes me so thankful to the teachers who answered it wilfully. Happy. This is the one factor that I could consider that would bring your class in a good atmosphere and soothing for learning because learners drawn with this kind of aura. Use the information from your personal results and those of the ten teachers in making your reflections that follow. After studying the results of your teacher survey, write down your reflection on the following situations reported to have happened in the school setting. Why are some teachers reported to have bumped a learner’s head on the wall or made a child swallow scratch paper or pencil filings? What attribute do you think is low for this teacher? Emotional Stability. 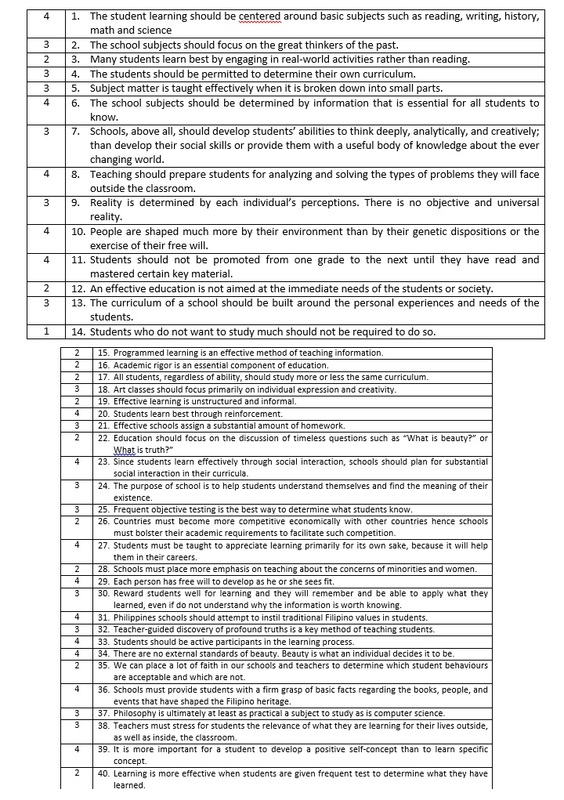 Based on the checklist under this attribute, it is all stated there the things that relates with a teacher’s temper. Once a teacher doesn’t have this kind of trait, they tend to do this without thinking too much. We cannot avoid losing our temper in some action as a person, but the thing is, we need to place them in an appropriate place. For this reason, a teacher should act and be more or less a mother that can stop their children without putting them in too much pressure. They are a child, making them swallow scratch paper or pencil filings as form of punishment will just make them loose their confidence that would affect them in the future. Why do you think some teachers are better loved by students than others? In order to attract students, you need to have a heart and a certain attitude that would attract them. From among the attributes, I would say a teacher need to reach a high level of COMPASSION and OBJECTIVENESS. As a teacher you need to be at your best at anytime, you need to have happy disposition and appreciate students within your class. A Happy disposition can attract people, and this is also applicable with the students. One said that children are the best one to sense the feeling of others around them. So giving them an atmosphere that give them an ease, and learn the meaning of positive living will give them a boost to make their life in a better. A better influence will also be spread to the students, who will be drawn by this kind of feeling. As a teacher, you need to be more objective. Treating a certain situation in fairness is a must, in order for them to feel of being judged fairly, and will not lose their confidence in a certain situation. Children also need to be brought up in a way that they could learn a high value of fairness, and to whom they could look up to this aside from their parents? Their teacher. If you were to choose, which personal attributes should all teachers possess? Why? I would say, a teacher should have a compassion, emotional stability, and self confidence. A teacher should have a heart. What’s good of having a brain with the heart that is full of nothingness? We, human are very expressive people towards other person. This is the reason why s/he needs to reach them through kindness, and our heart needs to function in a way that could understand the human heart. In the future, we need some people who need to spread love around the people, kindness towards others and a teacher could teach that to the students. A self restrain is needed in order to reach what we want for others. Unselfishness is also a must, so anger should be put in the appropriate situation. To act kindness and the courage to control your anger, self confidence is a must. Doubting once self of acting goodness to other is a toxic why of thinking. Confidence is needed in order to implement an effective teaching to ones’ students. When I was a student, I look up for those teachers who taught me as someone to be always prepared, and that they are the same from inside the classroom and outside, but it was not. From this experience alone, I did observe a teacher who was very different when she handled the class from the way she acted outside. This teacher holds out a humble and weak personality outside the class as I perceive it, but when she is inside the room, she is boosting with confidence. Her teaching style is very admirable since she can hide those weaknesses when she is in front of her students. As a part of the attitudes, this self-confidence is important enough in delivering your lesson to your students in order for them to be drawn by your teaching skill. I did realize this part after observing this certain teacher, which I really appreciate the way she handle herself in front of many learners and made me think of how this thing is important. Using what I have learned in this episode, when I become a teacher, I should learn some of this attributes in order to implement this to my students. If God’s well that I’ll be a lecturer to some learners, I would like to learn this attributes and have a restrain factor with my temper when I become one. One thing that I have learned from this episode is that, teaching should have a heart. Teaching doesn’t only mean just teaching, but it is further than this kind of thing. It made me understand the real meaning of being a teacher is to have a good value within thy self as a teacher. In this way, I became more aware of what are the things I should do for myself that would be applied to my students. Starting on this day, I need to have a self evaluation, and consider this attributes to be enhanced as I go along with this line of profession. In the near future, I would love to teach kids and make them realize of those beautiful things in this world, and become more positive in life. Fate will bring us all to the places where we should be, and I am praying to Allah (swt) that if this is good for me, hope He will fulfill my desire to help myself and become a tool for a change through imparting knowledge to the young ones. Identify the curriculum design used by schools. Reflect and write my insights/learning gained from the activities. A curriculum can be organized either horizontally or vertically. Write samples of them on the illustrations. TASK 1: Listen to the text. Take note of examples of intolerance discrimination and prejudice. TASK 2: Recall the bases of evaluating the relevance and validity of ideas. Current publications and other reference materials. TASK 3: Do you agree that…(Ask the student to explain his/her answer. 1st year Grammar: Use indirect discourse to report request to commands and advice. Divide the class into small groups and have them give the advice, commands or requests they would give or make in these situation (direct discourse). The other groups are to give in reported speech what was said. Transformation drill on direct and indirect discourse (Imperatives: requests, commands, advice) in problem situations. 2nd year Grammar: Direct and reported Speech Giving Instructions, Commands, Request. Activities: Transform the following direct statements to reported statements. 3rd years Grammar: Give and follow instructions using direct and reported speech. Activities: Round table discussion about agreeing and disagreeing in a given topic. Make requests, commands using indirect speech. Give an advice and get things done using reported speech. Giving advice and instructions to get things done. 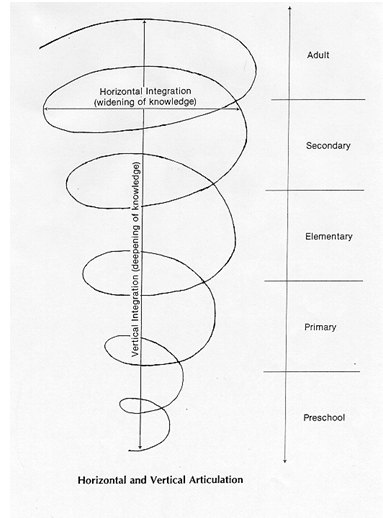 A spiral concept of the curriculum provides for both horizontal (widening of knowledge) and vertical (deepening of knowledge) aspects of the curriculum design simultaneously. 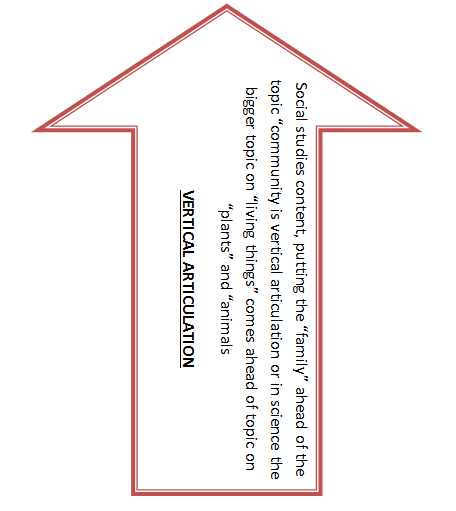 The figure below shows the concept of horizontal and vertical articulation from preschool to adult. Examine the Basic Education Curriculum. What aspect do you want to modify. Why? The Basic Education Curriculum that was mentioned from the facts that I did read contains a very concise and direct way of handling students in relation to their own learning, it almost cover all aspect of developing the kids into a rightful citizen of the Philippines. However, from all that details given in the said curriculum, I guess there is something that should be addressed that I want it to be modified in this kind of curriculum. I wanted to give an indication on the objective of this curriculum. I would like to add and give a big importance on the spiritual aspect of the students. Since, I am a Muslim born, and my knowledge in relation to my religion is not wide enough, and for this reason there is lacking in me that taught me the importance of God in our life. In the part of the students, while they are young it is an opportunity to teach them religion in a high regard and integrate it with every lesson. What curriculum models do you prefer? Why? From the three designs that were mentioned in the book, I prefer Problem-Centered Design, which draws on social problems, needs, interest and abilities of the learners. I love to implement this kind of design in a certain curriculum because of its salient feature that tries to let the students’ abilities blossom into a full realization. Students today don’t like to spoon feeding type of learning; they want challenges in a certain manner, something new that they can set their motivation on. Creating such atmosphere will give them a boost to realize their realization on a certain act. Through this kind of curriculum, the learner will be totally introduce to a more real life situation that will not caught unprepared in the future they want partake. 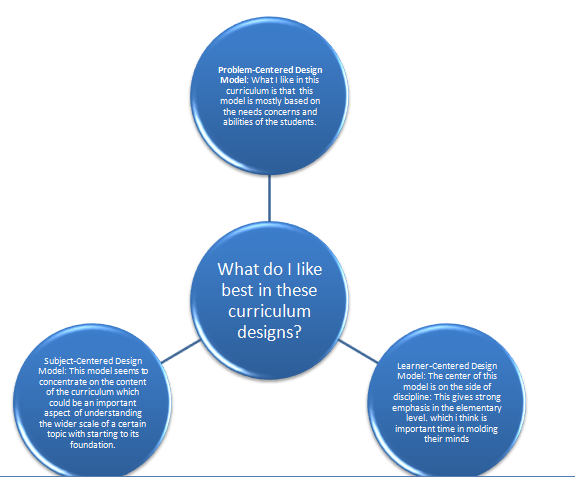 Make an illustration of any of the three curriculum design models. Be sure to incorporate the salient features of the design. WHAT’S THE CURRICULUM MADE OF? For this concept, go through the following steps. Interview a school administrator / faculty about how they concertize their school’s vision and goals into the curriculum. Visit a school and find out how they attain the aims of elementary, secondary and tertiary education. Interview one or two students and ask them their school’s vision / mission. For this Episode, visit a school / university or get a copy of the school brochure. Copy the school / university’s vision, mission and goals on this page. A Globally Competitive Institution of Higher Learning. Distinguished by its commitment to the total development of man through quality education. Islamic values and Advance learning concepts, methods and systems. The RC-AL Khwarizmi International College shall provide high quality of advance, professional and technical education to Muslims and other youths in the Philippines thereby serving as a catalyst of Development of the Muslim Communities especially in the ARMM through instruction research and extension services. How important is the school’s vision, mission, and goals in designing the curriculum? In human life, a goal/plan should be created in order to have his/her guide on how her/his life supposed to be or how s/he wants it to be. A curriculum should be in the same status. An objective is needed in order to direct the change in behaviour of the students which is the aim of learning, to change a person to a better citizen. A curriculum should entail this, and in order to create a path for a certain objective, they need to create a vision that redirects the institutions would be like to be in the future. A mission that aims the student on what they will become after being educated, and a goal that tends to set the intents of those things to be accomplished. What methods and strategies were employed by the school community to realize these goals? As per observed at their institution, they are providing all the necessities that the students needs, for them to learn in an ease environment. Other than this, they mostly employed teachers who are highly qualified and well motivated to teach the learner what they supposed to know. 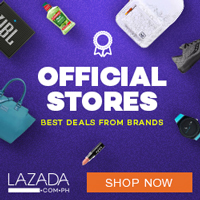 The administrators were also doing as much as they could to communicate some educators outside the Philippine in order to send the highly qualified students to the United States of America to learn more. In terms of their students, they seem to be vibrant kids, full of enthusiast. Confidence can be sense from them and inside the class; they wear a brimming energy of interest in learning. How did the students manifest that they have internalized their vision, mission and goals? As seen in the third year pearl, students were giving out a well mannered attitude as model students. You can sense how well they put/pose their self in a more professional way even they were just a third year student. The principal, Ms. Imelda Mamangconi was always praise this set of group for being doing well in their academic status, and it can also be seen in the observation we did see on that day. Due to excellence that they are projecting, some of them were given the opportunity to be sent in the USA to learn further. Curriculum is a life blood of education as I perceive as I’ve learned gradually in Educ 15s. The important aspect in learning. Upon creating this so called curriculum. Administrator of a certain school should implement their mission, vision and objective as bases in making/creating good curriculum. The administrators have this responsibility in developing such matter because they are dealing with the interest of their learner, which could affect their whole future. The school that we did observe were very accommodating, and even gave us permission to roam around their premises. In AKIC-SLS, we roam around in order to observe how they put this VISION, MISSION and GOALS inside the campus, however it was kind of frustrating since it wasn’t displayed anywhere the outskirt of the school except inside the learners’ classroom. So far we indeed observe three sections from elementary and secondary level. Two of the room namely Grade VI and 3rd year level display’s the VISION and MISSION inside the room as a part of their decoration inside the room. However, the display of VISION and MISSION are highly advice to place these aspects about the school inside the premises of the campus in order to be transparent to its reader especially for those parents. Furthermore, the school should as well put the GOAL/OBJECTIVE inside the campus and in the classroom. This school failed to implement this important aspect in promoting the school, as well as instilling to the young minds of their children for guidance throughout their school life. 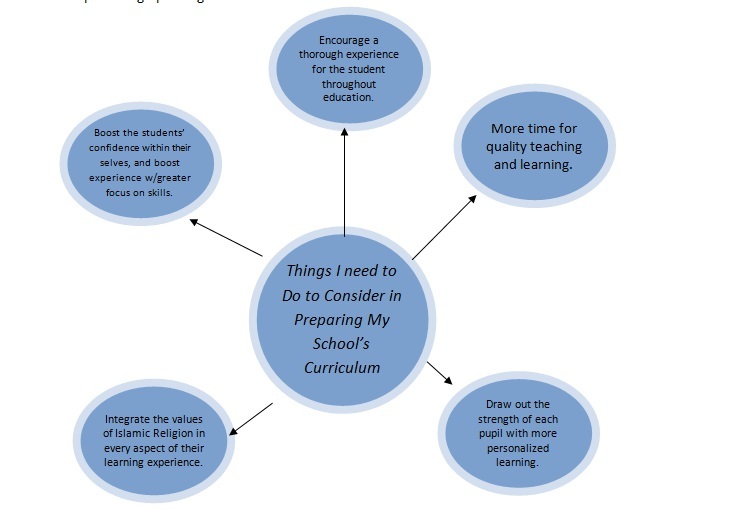 If you are to design a curriculum for your own school, what are the things you need to consider? Accomplish the graphic organizer below. Why do we need to consider the traditional and progressive points of view of curriculum? As a part in learning, we need to consider tradition and progressive point of view of curriculum since it is being used mostly inside the school. If we are going to observe a certain class identifying what can kind of teaching a teacher’s act, we can easily determined what kind of curriculum he/she is using. Through this, we can easily understand the meaning of this two, and upon applying this, we can easily tell which is more effective in student’s learning. How do the different educational philosophies relate to the curriculum in the schools you visited? Cite examples /situations? 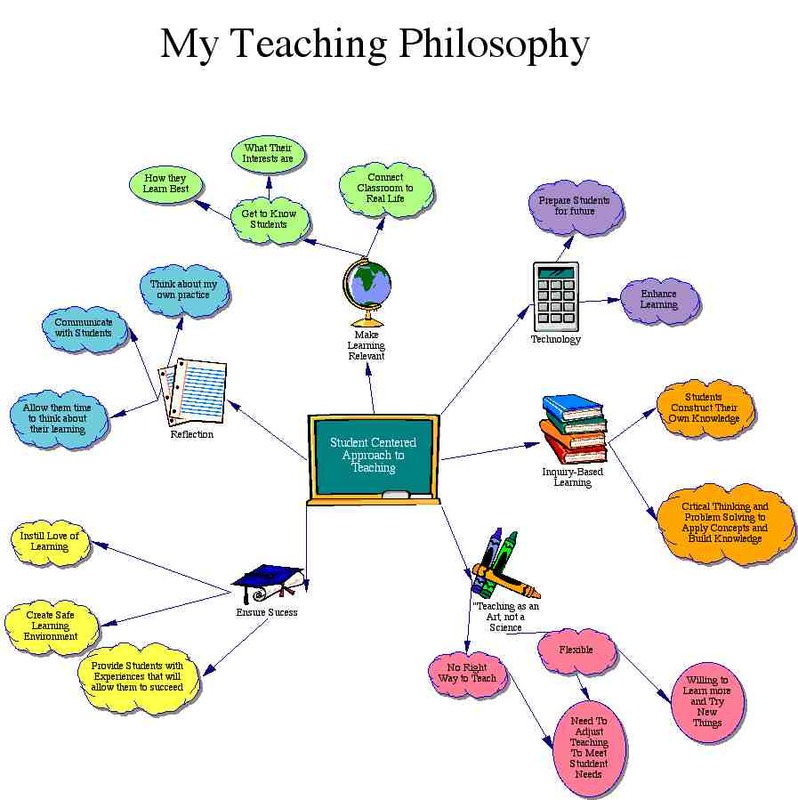 The educational philosophy is a very important in the curriculum in the schools because it gives guide for the curriculum of the school to follow. Without a philosophy seems to be like an empty shell. These philosophies become the “window” to the world and “compass” in life. These can be determined as the blue print of a certain teacher or in the curriculum as a whole in the school. Why is there a need to revise the curriculum from time to time? There is a need to revise the curriculum from time to time because society’s values and needs change over time. In the fast movement of the world today, every interest of every child is shifting or evolving as the times moves. The need of our society is becoming more demanding more than the previous years. Let site an example, during the 1950s, there was lot more emphasis on the home economics and industrial arts type of things, more emphasis on simply memorizing facts and rules. Nowadays, with technology shifts, and an economy that is base on different skills, if we had the same curriculum, it would be a catastrophe. Curricula have changed to meet the different needs that we have now. After interviewing a faculty of a school, and searched about these two kinds of curriculum, I could say that both of this two are very different when it is applied. Mostly, in our changing world today, students are becoming more innovative. They want to participate, give their opinion on a certain subject, try different experiences, and do a lot more. A mere traditional curriculum will not simply give them the edge of doing what they expect to fulfil while they are in school. There is that certain school that students were somehow complaining due to this traditional curriculum. They’ve mentioned that this academic curriculum was dreary as well as remote. According also to them, they were exposed to a situation of listening to recitations only. Lead discussions were a nightmare. Simply it is kind a boring type of learning for them. However, on the progressive curriculum, it is a type of curriculum accompanied a practical type of education that was even more pleasant as well as interesting in the students. A type of curriculum that was in a position to offer education that was centred to the interest of the child. They find this more interesting since they could voice out what they intended to share. Being facilitated by the teachers, the students can do the task in accordance with their own likings. They can learn more through application. From this testimony, we can assume that many of students now are truly evolving, and administrative schools either public or private need to cope up with these changes.